The dev team is small and they can't work on Deepworld full time. This means large features take longer to roll out. The purpose of the post is to suggest additions that should be relatively easier to implement (for the devs) but have a larger positive impact on the game (more bang for your buck, so to speak). Firstly, increase the variety of building blocks. With these, the quality of buildings (or at least the best ones) should increase, making Deepworld look more attractive, and people will be less annoyed by the meagre selection in the metallurgy tab. Why this should be easier to implement: The new blocks have to be designed and drawn, but then the existing blocks can be used as a template for everything else (rendering, inventory, placing, mining). Secondly, allow players to create builds that can be added to the game. I'll focus on two main areas here: Prefabs and loot destinations. Just yesterday when exploring a world, I found dungeons with the same prefab three times in a row (it was the one with the large crane and chest surrounded by roofs). That has happened on multiple occasions. Remember how the dungeon competition back in the day added all those new player-designed dungeons? We would benefit from more of that, but it doesn't have to be a competition. Instead, make one of those "Design submission" threads for people to submit prefabs suited for world generation. They could be dungeons or any other prefab that we're so used to seeing (now you can look at the corner of a prefab and know what the rest is). A stream of new prefabs would freshen up the game, especially for veterans, explore new possibilities and make things less predictable. Some areas such as brain biomes are in greater need of new buildings too. Back then, it didn't seem to take long for the devs to implement the dungeons into world gen. It's like they had a copy-paste tool. Now they could make a design submission thread, establish some clear rules (must be suited for world gen, no joke submissions, include picture, detailed description, coords for testing, etc. ), and pick the best designs that come in, giving a small compensation to the builder. I am sure that there are people here that would be happy to design new prefabs, and have also tested countless prefabs ingame, so they should hopefully know what they're doing. It adds another thing to do in Deepworld and another reason to build while contributing to development. Next is loot destinations. The idea for this is there can be individual protected worlds that contain things like chests of plenty (or quest locations). Unlike prefabs, these areas would be largely unique. Each world could have some sort of setting, challenge, theme, dungeon, story, etc. and is a place that players can visit and experience. Unlike unexplored worlds, each loot destination is permanent -- useful for an unlimited number of people. Since the whole world is custom-built, they can have more elaborate puzzles and such. Some could have entry requirements such as level, quest, achievement, order, etc. for progression purposes. The reason for each location being a separate protected world is so that they can be completely self-contained and uninterrupted by other people's buildings. Consider the current chest of plenty locations. The ones not in the tutorial are surrounded by protectors and spam in general. Again, there can be a forum thread for submitting these. Establish very clear rules and pick only the best. The devs can clone the suitable submission world and add the finishing touches, creating a permanent location to visit, a world that won't be abandoned so long as there are players. Including these types locations into the mix of worlds complements the current world system and adds more to the exploration and building aspects of the game. Why this should be easier to implement: Letting the playerbase do the bulk of the designing saves the devs a lot of time and effort. And they have already shown that they can copy-paste worlds and buildings, as well as build the tutorial worlds, chests of plenty, etc. Note that adding more structural blocks would help with making prefabs and loot destinations. As you can see, these ideas don't change Deepworld in a major way, they improve what is already there. If anything I said here is wrong (not relatively easy to do), please tell us why. I'm sure many of us would like to know more about how Deepworld works. Great ideas and a wonderful build in the picture of you ask me! -claps- I love it! Plus, I would love to see another dungeon competition where the winner's dungeons get implemented. Oooohh I can't wait to see this happen, especially the dungeons. I bought Starbound a while ago and one of the things they do well is having a background version of all the front blocks (even ores). 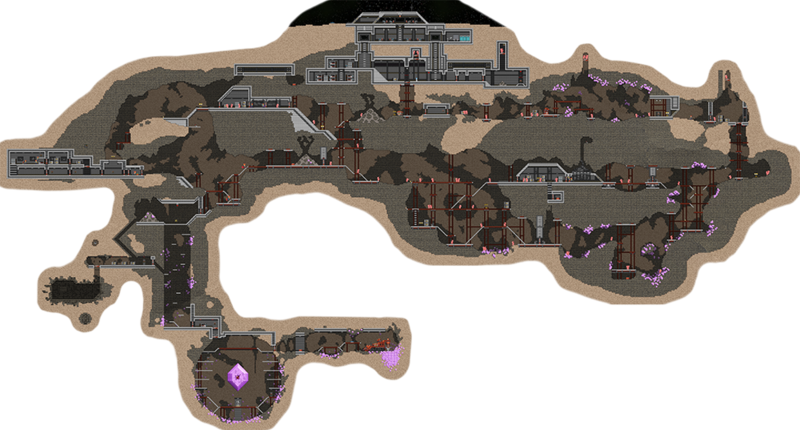 I would like to see background roofs in Deepworld. They also have instance missions, which are mission locations that can be warped to from the ship. However, some people argue that being able to warp directly to the mission location diminishes the exploratory aspect of the game and makes the ship too much of a central hub. Deepworld, on the other hand, already features a lot of jumping between worlds, which is why I said it "complements" the world system. Exploring a loot destination would also be a nice change of pace from the usual rush in unexplored worlds. No need to be constantly mining or moving to reach the unexplored chunks first. Hint: The above panorama is a good reference for a loot destination. Great suggestions, and I would like to get all those things rolling. We're actually tackling the building blocks one in the next couple weeks. Can you guys chime in and give me a list of your most-wanted building blocks? As many suggestions as you have! Diagonal blocks that can be turned in different directions. Upside down roof pieces would be good. As well as glass blocks, painted walls (think paper as a block, with different colours), onyx and diamond blocks, too! Could there be a pale wood colour please? Blocks and backdrops with a wood grain pattern would be great. Scrap block - could look a bit like the ones from Wall-E, maybe make it a greyish scrap heap earthy-type block (like the bone wall but hopefully better). And make sure to include blocks that actually look like they're in the background - muted/darker colours, low contrast, less detail. Green blocks, for grass. Maybe these could be crafted with earth and zinc? I have so much zinc it's not even funny. Rotatable mechanical switches ( just like spikes ). I don't have any specifics in mind but I would like blocks with mostly one solid color that would be really useful and effective for all types of buildings, like the traditional house, a fancy colorful shop, pixel art, ships or other aircraft/war/PvP type of building, or maybe even a factory or other type of metal-based building. Different types like a 2x1 that's flat and a sloped 2x1. Edit: also more glass blocks/backgrounds. Perhaps a stained glass backdrop or arched Windows. The arched Windows could work much the same way the borders work on reinforced metal blocks. At the top (or bottom), make the blocks border-texture really curved with some darkwood fill or something. Kind of like that. We can hide the bottom of it underneathe the floor block if we want it to sit flush with the ground. It would also be good for making portholes or other stylisticly round Windows. Brassy and coppery versions of the iron backdrop would be cool, too. My favorite thing about iron backdrop is that it's seamless ... no brick lines or rivet lines or any of that stuff. Great for that clean, minimalist look. Different colored lights. Red crystals can make red lights, blue:blue, etc. Diamonds make a super bright light? When mining stone, not the scraps but the actual rock in the ground, u have a chance to find shards. These shards can make up crystals diamonds, and even onyx. It would be nice if some of the current artwork was improved. There are some blocks that I dislike and avoid using. I'll try to explain why. * bone wall just looks strange - maybe there are too many skulls facing outward. Maybe it's because the insides have so much contrast compared to the borders. The bone pile looks fine though. * cobblestone somehow looks strange. A contributing factor for the front cobblestone is its strange block border - it barely matches the inside of the block and you'll notice a shadow under the top edge of the borders, which suggests an overhang. This shadow can also be seen for the metal and wood front blocks but it is suitable for them. * Limestone and sandstone front blocks suffer from the same block border and shadow problem as cobblestone. On the other hand, I quite like sandstone backdrop since it's not overly bright/detailed and makes a good background. * The block borders for stone, sandstone and limestone front brick don't match the gaps between the bricks within the block. It's jarring. Stone brick backdrop also has this problem so I try to stuff the borders under other blocks whenever possible. * On the other hand, the adobe block borders are reasonably similar to the insides, red brick and sandstone backdrop have borders of a similar colour, and the borders of blue brick are fairly dark and thin, so they're okay. It's also easier to blend blocks with unobtrusive borders. * I really liked the borders of the old background wood (bottom right), but now they barely match the insides, and the insides are a too detailed. Those metal bits on all the wood backdrops are probably unnecessary. And using the same border for them all is lazy and doesn't work. * The cage just looks weird. I remember the old cage texture had some applications in building. * And have you noticed that we have two identical chains with one being slightly darker than the other? Another thing: Some of the natural blocks have tiling patterns with obvious borders, for example, the bottom three layers of the hell biome. Moreover, it can be hard to see the stalagmites in hell and deep biomes, and I think the backgrounds might also be a bit too detailed. This is just my own opinion though. What does everyone else think about this? Hmm, also, I really wish we could get tin ore (cassiterite) as well. (We don't need tin blocks, that's stupid, we would just need tin ingots) To make bronze, you would need 9 copper blocks and 1 tin ingot. The result would be 10 bronze blocks. Also, I know that this really doesn't matter, and that the metallurgy system isn't that important, and this would NOT be the easiest way to improve deepworld, but it would be amazing to have an overhaul of the metallurgy system. I hate when games have stupidly simple metal refinery, (terraria, minecraft, deepworld) for metallurgy is a very complicated and convoluted process. I mean, what the heck is copper ore?!? What is it?!? Chalcopyrite?!? Just name it one ore, because there are so many different ores that can have copper, and there is no true "copper ore". I like it a lot more when an ore is just named the most common one, and for copper it would be chalcopyrite. (It would probably need a little description for all the non-metallurgy nerds) For iron it would be hematite, because that is the most commonly used iron ore. It would also make sense to have to refine ores at a forge, (except for iron, that needs a blast furnace) for ores like cassiterite need refining before they are turned into copper. Since involving all the steps would be too complicated, we could just assume there was the needed silicon dioxide already loaded in. We can also assume with the amazing technology we have, this process of extraction takes like a second and instantly gives us copper blocks. For iron, one would need a large 25-35 meter tall tower constructed out of bricks. The top and bottom would have special blocks. The bottom would have a 5 wide 2 tall block called a "blast furnace base". 20 steel-lined brick blocks (the steel lining would only be on one side, so looking different directions change the side facing out. The steel-lines side should be facing the outside of the furnace. One could find steel-lined bricks in a special dungeon with them, and they would be found in batches of 3-10 blocks per rare dungeon) stacked up on the edges of the base would be topped of with a 5 wide 3 tall top called a "blast furnace top". When the structure is completed, the inside of the furnace would need to be filled with brick backdrop. Once all blocks and in place, the inside of the furnace would turn dark. When hematite, charcoal, (produced by getting wood in your hotbar and tapping a forge) and limestone are placed on top of the blast furnace top, and an air compressor (new useful machine that needs steam power, let's just assume it compresses pure oxygen only) would have to be hooked up to a powered furnace with a pipe, and the furnace would have to be hooked up to the base of the blast furnace. When all of this is in place, the inside of the forge would be filled up with a red glow and fire, the limestone, hematite, and charcoal would be gone, and 3 pig iron blocks worth of molten metal would come out a tap on the base. Before that, one would have to make a 5 wide 2 tall rectangle of ceramic blocks and an hollow out the top so there would be a walled and floored 3 wide hollowed space. The pig iron would poor into this ceramic basin and stay there until channeled into a converter or cooled into solid pig iron blocks. For steel, one would need a converter, which is a large vessel used for converting pig iron to steel. If one only has pig iron blocks, one would hold a pig iron block in the hotbar and tap on forges to make it molten. The metal would come out of a tap which can be channeled into a converter with ceramic channels. When there is a sufficient amount of molten pig iron in the converter, one would connect a powered furnace that has a powered air compressor attached to it with pipes to a spot on the converter. (It would be useful to have a toggle able pipe activated by a lever) When connected, flames would come out of the mouth of the converter, and when these flames change one would stop the air flow and turn on the tap of the converter. Out would come molten STEEL?! ?, which would be channeled into the same designed basin as before, and this time it would just cool to form STEEL?!? blocks. These steel blocks would only be obtainable through this convoluted method. Finally, steel would be used for making super hard to craft things, such as onyx world machine parts, special tools and weapons, special exo-suits, and much more! Steel would probably be a hard to get metal, for the obtaining process is slow and complicated just to produce 3 blocks of it. And, anyways, STEEL?!? I had another idea for another metallurgy process for making not-so-realistic alloys. I'll put a link here later. All of this would be hard to do, and it would take awhile for a team of 2 developers. So, it's not really top priority. Oh, my. I seem to have typed WAAAY more than I wanted to. I like the idea but the common names might be an issue... I'm sure most people who play deepworld don't know those terms... Deepworld has been using "copper ore" for a long time. I'm pretty sure it would confuse lots of people if it were changed. I like the steel part of it. How it would be used to craft cool and useful items is interesting. Thats why clicking and holding until a little menu pops up would be a thing when in the inventory menu. It would say on the tab, "A mineral used for its copper content."